Cyril Giresse, a winegrower, said hailstones "the size of pigeons' eggs" destroyed grape buds and left vines bare on Saturday. "The storm lasted only about 15 minutes, but in some places, there's nothing left at all," said Mr Giresse, who runs the Château Gravettes Samonac, in Bordeaux's Côtes de Bourg appellation. "No leaves, no grapes, just the vines stripped as if the grapes had all been picked." Jean-Dominique Château, another claret producer, said: "I've got nothing left. I've been growing grapes for 33 years and this is the worst storm I've ever seen. "Last year we lost 40pc of our crop to hail but this year it's going to be an even worse disaster." 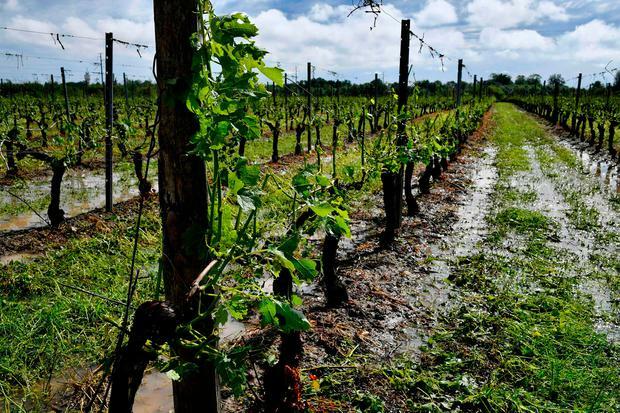 Stéphane Travert, the agriculture minister, said the government was assessing the extent of losses and would aid wine producers. "We'll take the necessary measures and we're ready to meet Bordeaux winemakers," he said. Franck Jullion, the head of the producers' association in the Blaye Côtes de Bordeaux appellation, said: "It's a desolate vista, as if the vines had gone back to winter. Estates hit by frost last year will not recover. We're going to need a lot of support and solidarity." Didier Gontier, director of the Côtes de Bourg appellation, said: "Winegrowers say they've got no vines left for next year so this is going to affect two years of production."